It felt like I was up there for hours when it was happening, but then it was over with a massive sense of relief. That’s how I’d summarise my first presentation in front of fellow NatSCA conference attendees. We (myself and another two Natural Science Curatorial Trainees, Glenn and Lukas) had been asked to prepare a talk fitting with the conference theme of ‘Museums Unleashed’. The conference was to focus on sharing collections using digital platforms, television and other forms of media, so we decided to present on our own use of Social Media throughout the 12 months of our Traineeships. The presentation we came up with explored our use mainly of Twitter and WordPress throughout our year (other social media platforms are available), which we used to document our experiences and engage with the wider museum community. We were able to speak about things such as how fun Social Media can be when it’s used well, and how good of a platform it can be to engage with members of the public in order to (hopefully) dispel some of the myth about museums being so exclusive. 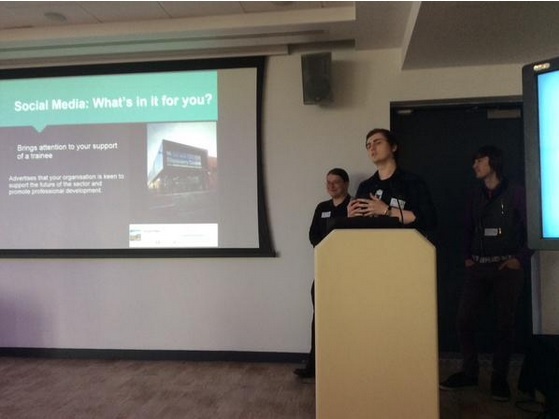 We also got to speak about how Social Media (from our perspective as trainees) could be used for our host museums. For example, showing the support of an institution or organisation for a trainee by letting them be there, working with collections and allowing them to further advocate said collections. Our presentation allowed us to touch on some things that can make Social Media a challenge too, such as building a following. This can be difficult, especially when trying to expand outside the ‘Museum bubble’ – it can be hard to find those who may be interested in a particular discipline or hashtag.